Retaining a job is almost as important as getting one in these competitive times. Opponents and hidden enemies will try everything to pull a competitor down, in order to climb the ladder and progress. I get numerous such requests from harassed people, who somehow wish to put an end to these obstacles in their jobs. Though I do not promise anything, I still try to provide solutions for each and every problem. In this post is given a Yantra to remove job obstacles and give peace of mind. These are 4 separate Yantras; but as the procedure, purpose and end result is exactly the same, I am combining them together. The Yantra is to be prepared on a white piece of paper or a Bhojpatra. The ink to be used is Ashtagandha. The writing instrument is a pointed stick of the Guava Tree. 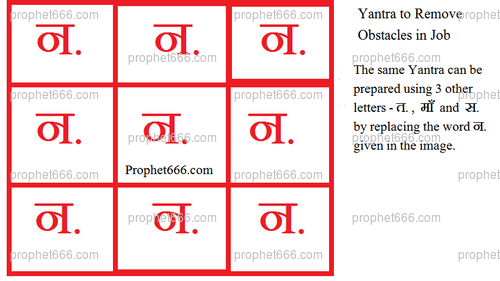 The Yantra can be prepared by inserting any one of these 4 letters – न. त. माँ and स. in the 9 squares of the Yantra. Then once the Yantra is prepared it must be worshiped with offerings of Dhoop- Deep and Scented Flowers. Then some sweet Mithai should be offered to the Yantra as Prasad. The Prasad can after sometime be eaten. Then the Yantra should be folded and inserted in a Silver Locket and tied on the forearm of the right hand. Sir, can any colour thread be used ? Can it be prepared on any day ? Red colored thread should be better for this Yantra. It is better that your wife prepare the Yantra herself and worship it. The Yantra can be prepared on any day.